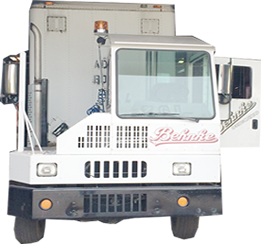 Behnke Logistics is a dedicated trucking operation that primarily picks-up and delivers customers’ products on a daily basis. With logistical expertise, competitive rates and direct communication between client and driver our on-time delivery performance is “TOPS” in the transportation industry. If the conventional box trailer does not meet your needs, we have flatbeds and temperature controlled units that can handle your requirements. Behnke can haul less than truckload cargo to multiple consignees in one daily route saving the customer costs over the tractor/trailer combination. Rolling tarp system handles specialized freight that cannot be loaded on a conventional box trailer. Check out our new Spotter Service! Engineered with workhorse mentality and new operator refinements, delivering uncompromising durability. If you need it there today, try our Expedited Sprinter Service! Get it there quick. We’re ready for you now. With Behnke Specialized, we can haul your scrap iron, gravel, or any other commodity that requires a dump trailer.